Dora's Fan Club is here! THIS CLUB IS FREE TO JOIN!!!!!!!!!!!! Like I have said before I have a sixteen month old son who thinks Dora is the greatest thing alive. He has been learning words from Dora and learned how to dance from watching Dora. Now everytime he hears "We did!" He starts twisting along with Dora and Boots. I thought hey why not start a fan club that kids and parents would love. Since I am just starting it up feed back of what you would like to see happen would be great. I can post pictures sent to me on "Map's Treasure" Page. There is a place to leave ideas, in the Backpack's page. Sign my guest book, and Dora will sent you an email. As I get more feed back I will try to update everyone and tell you how this will all work. Thanks for your patience. 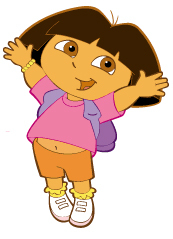 When you sign up for the club, along with the email from Dora I will sent you an image of DORA that you can take and make into an iron on transfer FREE.